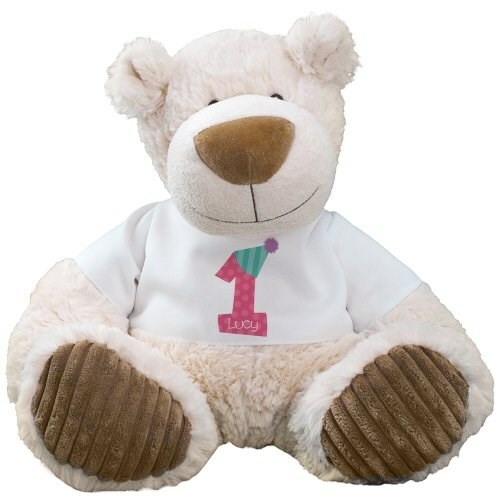 Give your little girl a very memorable Happy Birthday with our plush teddy bear. This cute bear is named Latte and has an adorable smile and a soft, cuddly feel. Measuring 12” tall, Latte features the classic Aurora plush style. She is sure to love cuddling up with Latte and bopping his over-sized nose. His cream color exterior is enjoyably soft and the corduroy pads on his plush feet offer a velvety texture. Latte wears a t-shirt that may be customized with any name and age 1 thru 5. Free gift wrapping and a free gift message are also included to create a thoughtful presentation. Additional Details Make sure to check out all of our Birthday bears to help wish that special someone a very Happy Birthday.